You may think that with the NBA Finals over and the NBA Draft in the rearview mirror, the National Basketball Association is about to enter lull period. However, you couldn’t be more wrong. Starting July 1, free agency takes center stage. Get ready for some exciting developments, as we’ll finally get to see just how good organizations are at selling their vision to the game’s biggest stars. Players will choose destinations based on a variety of different reasons. Some will opt to go where the most dollars are available, while others will look to join forces with title contenders. And others still will remain in a fixed position because their current clubs can offer them the best of both worlds. So if you’re fascinated with the professional version of musical chairs, we suggest you tune into the upcoming show. Make sure you get to your seats; curtain’s up at midnight. Not everything about the NBA free agency is set in stone. Keeping that in mind, we kindly offer our best guesses as to where the 12 best NBA free agents will sign. 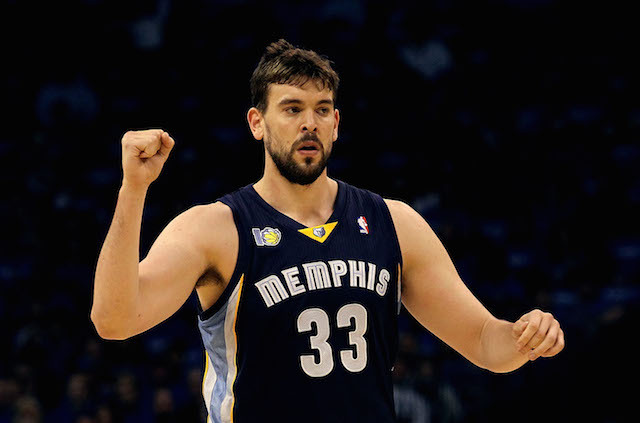 Marc Gasol (pictured above) had a big 2014-15 season, averaging 17.4 points, 7.8 rebounds, and 3.8 assists per game. Heading into this offseason, he was expected to be one of the most coveted players on the open market. However, it would appear that all outside efforts would be futile. According to ESPN, Gasol is not taking any meetings other than with the Memphis Grizzlies. The two sides will come together in Spain on Wednesday and many believe a verbal agreement on a new contract will soon follow. After 18 seasons with the San Antonio Spurs, Tim Duncan was either going to call it a career or chase one last championship with the only franchise he’s ever known. Per Marc Stein of ESPN, the Spurs are working under the assumption that The Big Fundamental will be back for the 2015-16 season. That’s good enough for us. Small foward Kawhi Leonard has slowly emerged as the next face of the Spurs franchise. Other organizations can do their best to pry away the 2014 NBA Finals MVP with the oven mitts for hands, but the expectations are that San Antonio will be more than happy to give the 2015 Defensive Player of the Year a five-year max deal. 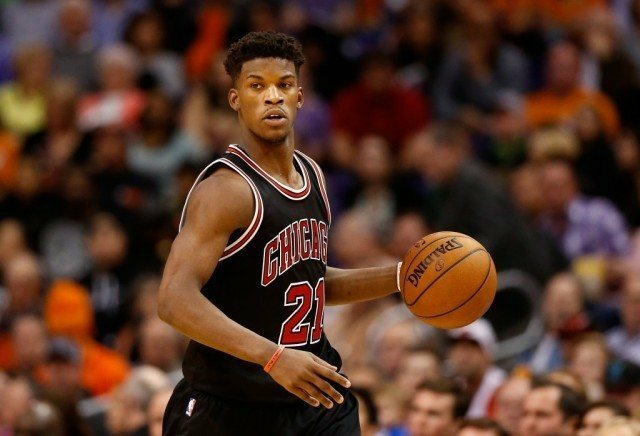 After emerging as a bona fide superstar during this past 2014-15 season, Chicago Bulls’ Jimmy Butler (pictured above) was excited to see what this offseason had to bring. Initially, it was reported the NBA’s Most Improved Player was interested in signing a one-year deal with the Los Angeles Lakers. However, considering the All-Star is a restricted free agent, one had to wonder if his representatives were merely looking for leverage. Too bad his current team has, since, backed him into a corner. The Bulls have given the shooting guard a maximum qualifying offer and a one-year qualifying offer and, as a result, Butler has postponed meetings with other teams in order to decide how many years he’ll resign with the Bulls for. We guess that settles that. 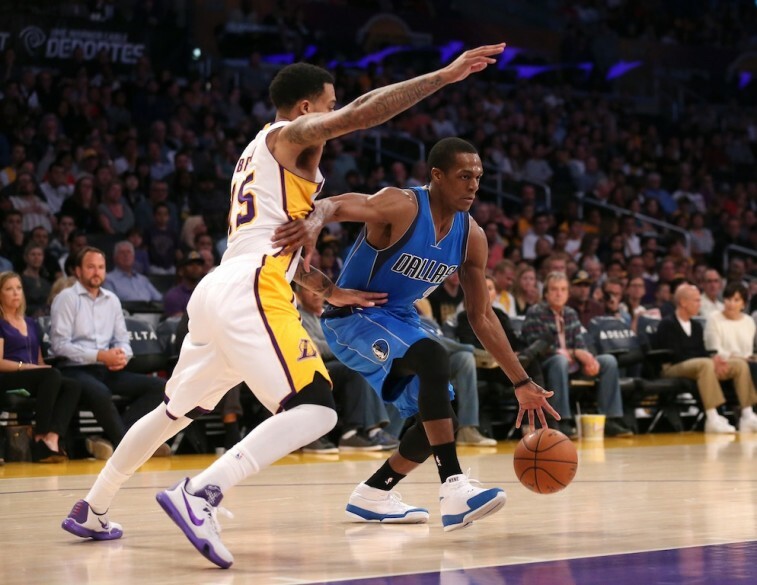 Everyone and their mother knows that Rajon Rondo (pictured above) has no intention of extending his stay with the Dallas Mavericks. For once, it appears the player and team are on the same page. There was a point in time when we firmly believed the talented — albeit difficult — point guard was destined for Tinseltown. However, since the Los Angeles Lakers drafted D’Angelo Russell with the No. 2 overall pick in the 2015 NBA Draft, we’re no longer convinced the crafty guard is made for the Hollywood lifestyle. Therefore, since reports have circulated of mutual interest between Rondo and the Sacramento Kings, we wouldn’t be surprised to see the 29-year-old playing for another team in the great state of California — so long as they can find a way to make the necessary cap space. It doesn’t appear there will be any drama between the Phoenix Suns and point guard Brandon Knight, whom they acquired in a trade with the Milwaukee Bucks back in February. According to The Racine Journal-Times — via CBS Sports — the Suns are expected to sign the 23-year-old to a five-year, $70 million when free agency gets underway on July 1. We wonder how that will end up going over. Miami Heat lifer Dwyane Wade (above, right) will find himself on the open market after declining the $16.1 million player option he had for the upcoming 2015-16 season. The future Hall of Famer has consistently put the team before his own personal well being and was hoping to be compensated for the years of sacrifice he’s made on behalf of the Heat organization. However, since feeling slighted by the only franchise he’s ever known, D-Wade is now prepared to see if he can get a more reasonable payday elsewhere. At present, there have been reports of mutual interest between Flash and the Los Angeles Lakers, as well as rumors that suggest the 11-time All-Star is also intrigued by the Los Angeles Clippers. Of course, the chances of joining the latter LA team would be a long shot on account of the club’s cap limitations. 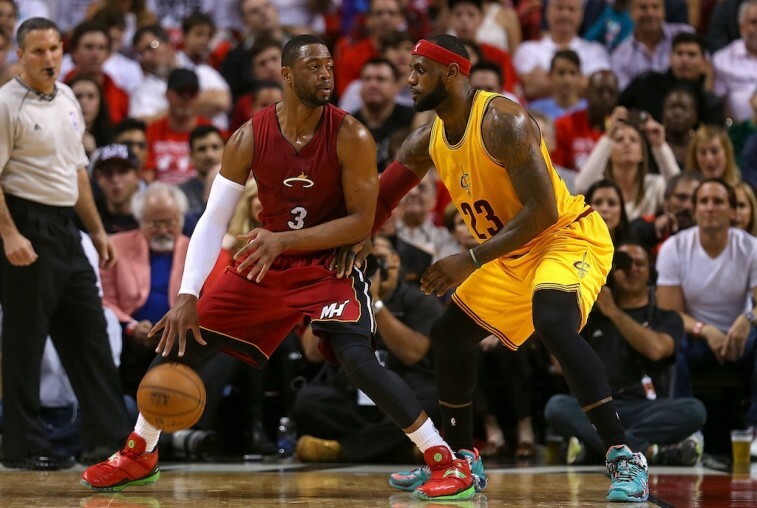 In the end, we can’t Wade and the Miami Heat not coming to some sort of agreement. 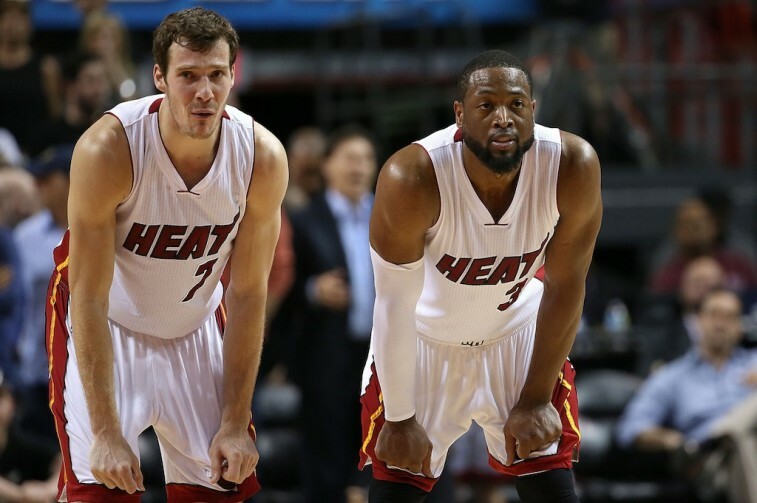 Goran Dragic (above, left) is another member of the Miami Heat who has opted out of his contract for the upcoming 2015-16 season. However, this is something his current organization always expected to happen. According to sources, the Heat are planning to offer the point guard a five-year deal, but not at a max salary. Should this be the case, Dragic will certainly be willing to field offers from other franchises. Yet, in the end, we have a feeling the former Phoenix Sun will decide to keep his talents in South Beach. Of course, should Wade opt to leave the organization, then all bets are off. The best basketball player on the planet came home to Cleveland, led the team to the NBA Finals, and declined his $21.6 million player option for the 2015-16 season. Yet, the Cavaliers faithful have nothing to fear. 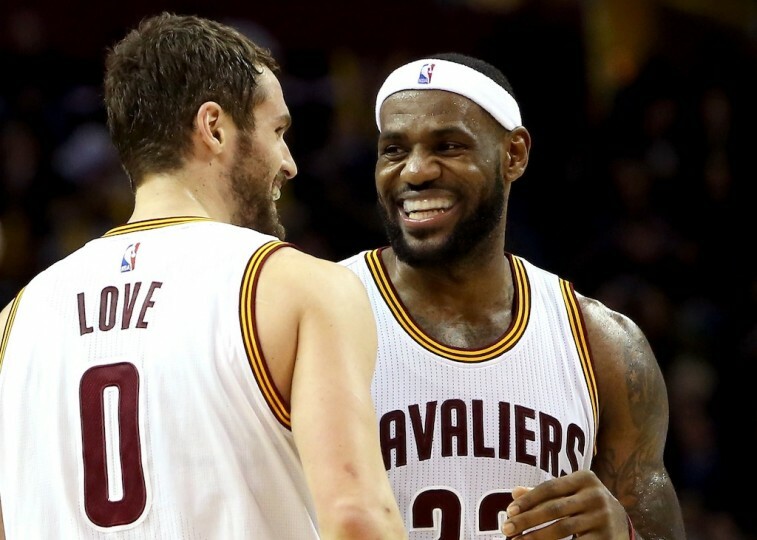 LeBron James (above, right) is expected to repeat the same steps as last year and sign a one-year control with a player option for the 2016-17 season. Therefore he’ll make roughly $22 million for the upcoming season, then opt out again, and sign a massive contract once the new television deal comes into effect. It really is good to be the King. Los Angeles Clippers center DeAndre Jordan is expected to be a hot commodity on the free-agent market come July 1. His first meeting on Wednesday is scheduled to be with the Dallas Mavericks at the office of his representatives (Relativity Sports) in Beverly Hills. Later in the day, he is expected to meet with the Los Angeles Lakers and the New York Knicks. The final suitors for the Jordan’s services will be his current club — the Los Angeles Clippers — on Thursday. This should be an exciting affair, as a video presentation is expected to be part of the team’s pitch. According to league sources, should Jordan opt to leave the Clippers, the most likely destination would be the Dallas Mavericks. We’ll see soon enough if Chandler Parson truly is the best recruiter in the NBA. For now, though, we think the defensive giant stays with the Clippers. Prediction: Re-signs with the Los Angeles Clippers. 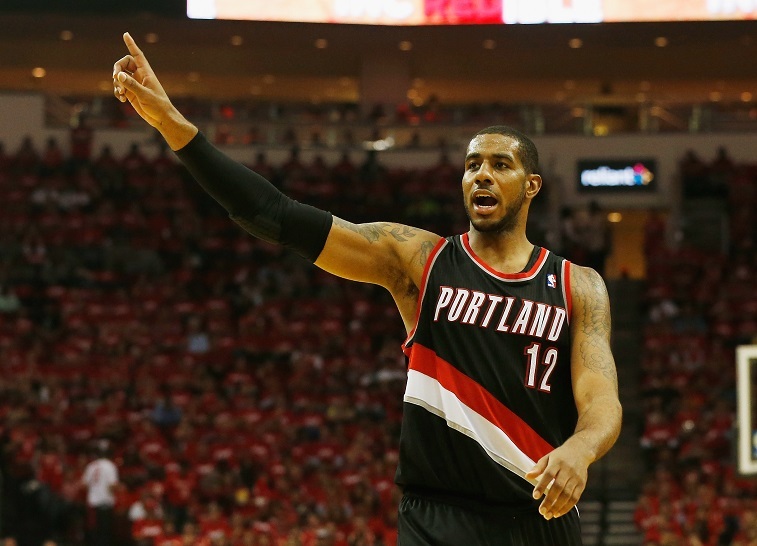 When free agency gets underway on July 1, there won’t be a busier individual than Portland Trail Blazers forward LaMarcus Aldridge (pictured above). He is scheduled to meet with the Los Angeles Lakers and the Houston Rockets first. After that, he’ll get together with the San Antonio Spurs, Dallas Mavericks, Phoenix Suns, and Toronto Raptors on Wednesday. Aldridge will wrap things up with the New York Knicks on Thursday. While his current club can offer him the most money, it would seem that he has all but closed the chapter on that part of his career. Should Aldridge decide to take his talents elsewhere, the common belief is that he’ll most likely end up in San Antonio. We happen to agree wholeheartedly agree with that. Prediction: Signs with the San Antonio Spurs. All statistics are courtesy of Basketball-Reference.com, ESPN.go.com, and NBA.com.